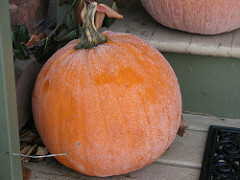 There’s frost on the pumpkin! There’s frost on the pumpkin! Do you have your winter supply of hay? Don’t wait until the roads are icy and the weather is nasty to fill your barn! We still have premium grass hay and a little grass/alfalfa mix available. This entry was posted on Tuesday, October 23rd, 2018 at 7:59 am	and is filed under General. You can follow any responses to this entry through the RSS 2.0 feed.